Over the last 6 months I have been working with the latest instructional technologies and digital tools in my class, Humanities 100. This course, brand new for the 2014-15 academic year is designed to teach students how to create a digital project with archival materials. The goal of the course is to teach students the importance of the creation of a digital text; to think about the design of data that stems from that digital text; to make intelligent decisions about the presentation of that digital text on the web; to teach students how to mark up a text in TEI lite and beyond; to begin to think about how to add geo-spatial elements to the analysis; and also how that text can be mined to build up a database of people and places (at the least) that can then be used to create a network analysis of the text. That is a lot to learn; and from my experience last semester I can say that some students wanted to stop at, say, transcription of the text, or mark-up. Some were taking the class because they had heard that through it they would learn how to use Gephi and then be able to produce cool visualizations of other data (maybe from another course). Still others wanted to learn how to use Arc Online to begin the process of thinking about spatial analysis. But the students were all carried along (some more readily than others) by the pace of learning, which was quick. As the students were learning all these different tools and platforms, I was too. Some I had used myself and was pretty proficient in them (ArcGIS and Gephi, for example). However, others were very new to me (TEI and CSS) and class was sometimes an exercise in mutual instruction. My colleague, Diane Jakacki, who was teaching a parallel section of the course using different archival materials, kept me on the straight and narrow, constantly conferring with me about assignment design, pacing, instruction methodology. Thus, around the midpoint of the semester, we began to attend each others’ classes on a regular basis, helping out where needed, and learning from each other as peers. The students in both sections soon realized that Diane and I were working as a team. Our collaboration in the classroom, our respect for each other’s expertise modeled for them the way in which Digital Scholars should work. In the field of emerging digital technologies, where a platform or tool can appear one week and be incorporated into class within two, such collaboration is vital. And given the range of digital tools we were using, from visualization to TEI, it was very likely that one of us would be the point person for that particular tool. Students regularly witnessed how we consulted each other, helped them, conferred constantly about how to move forward, both in the classroom and outside. And they liked it. Class atmosphere was relaxed; the time flew by. In my section of the class, the final projects for last semester were almost all collaborative. One group had chosen early on to transcribe and mark up 23 pages of the first months of the Shamokin Diary (as composed by the Moravian missionary, Martin Mack in English). This was a difficult and challenging task, not least because of the handwriting in the manuscript and the variant spellings of the many Native American names. Another student chose to transcribe and mark up the memoir of Martha Powell, wife of Joseph Powell, the missionary whose own daily diary of the Shamokin mission we had worked on all semester as a class, and who not once mentioned his wife in his many pages of writing. Even when the students thought they were done, Diane and I spent many hours, correcting the transcription, cleaning up the TEI, creating CSS files for publishing. Other students chose to visualize the networks of the missions, creating databases of people and places who were mentioned in the mission diary in the earliest period (covered by Mack) and then later in the period covered by Powell. The network analysis allowed the students to ask important questions: for example, which missionary had more contact with influential Native Americans and Colonial agents, and did this have an effect on the success of the mission? Others mapped the movements of one of the Moravian missionaries up the West Branch of the Susquehanna River to visit the important Native American villages in the “Long Reach”, the stretch of the West Branch between today’s Jersey Shore and Muncy. 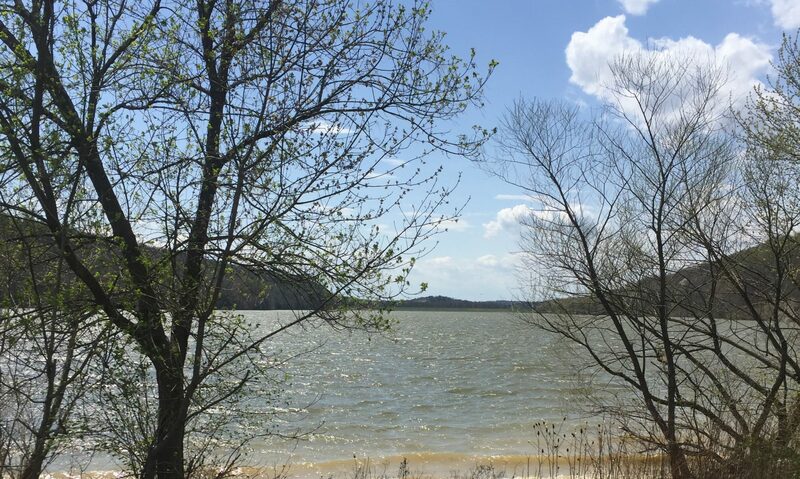 This 1753 trip followed the Great Warrior’s Path up the river and revealed accounts of the way in which the Native Americans in the Susquehanna Valley during the Colonial period interacted with the Moravians, who were usually greeted with friendship, but sometimes with suspicion and hostility. On the whole, I was pleased with the students’ final projects. [They can be found here] Some had worked very well together and that success was revealed in their product and their performance. Others found collaborating very difficult and that lack of success also had an effect on the final product for the course. Final grades of course reflected the collaborative contribution of each student to their respective team. But still, I had to watch as one student was left completely high and dry by a collaborator who didn’t want to play. This semester I am teaching the course again, with a smaller group and without Diane teaching a parallel section. The archival materials we are working with came from the suggestion of the Assistant Archivist of the Moravian Archives in Bethlehem, Tom McCollough, They are very different from the Shamokin Diaries in their focus. No longer is the talk of Shilkellamy and the Susquehanna River. The pages we are working on constitute the travel journal of two itinerant Moravian preachers, Jasper Payne and Christian Froehlich, on their way to and from the Chesapeake Bay in 1747 with the intention of preaching to the slaves who are working on the plantations. The journal tells of the difficulties of finding places to sleep for the night, getting signatures for their travel passes, the initial encouragement from plantation owners to speak to the slaves that is only later withdrawn due to pressure from the local populace. There is even the record of a conversation with one of the enslaved men. The difference in archival materials is accompanied by a radical (but wonderful) difference in the digital repository and transcription and mark up platform we are using. Over the winter break, there were two developments that have made for much smoother sailing this semester. 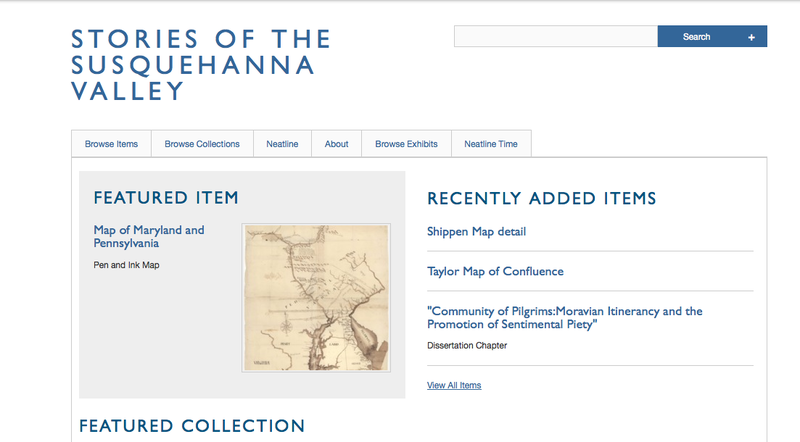 One, we were able to finalize the Omeka instance at Bucknell and a student spent her winter break adding digital files and metadata to the Stories of the Susquehanna collection that had been started last summer. Second, Diane and I heard about the release of Juxta Editions, a professional editing platform that allows for transcription, markup, and publishing all from one interface. Diane, on the spot at the MLA in Vancouver, immediately contacted the developer and inquired whether we could use the platform for the class. Yes, and we would be the first class to do so! Importing the digital scans from Omeka was easy, and the class was set up with online free accounts as collaborators on the digital edition of the Payne and Froehlich Travel Diary. Wednesday was the first collaborative transcription class using Juxta Editions and we will report back on progress. But so far, the experience has been great!